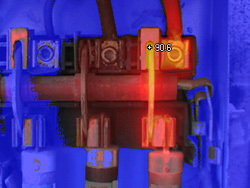 We now offer Houston Thermal Testing with our new state of the art Fluke Thermal Imager. This TI55 Flexcam can detect very slight differences in temperature and will help us and our customers prevent electrical failures before they occur. 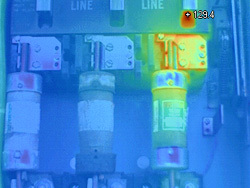 We now offer Thermal Testing with our new state of the art Fluke Thermal Imager. 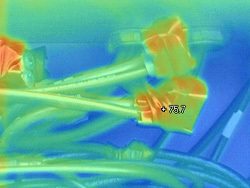 This TI55 Flexcam can detect very slight differences in temperature and will help us and our customers prevent electrical failures before they occur. Detailed reports with problem areas pinpointed are included with our service. By using this preventative maintenance technique we are able to eliminate costly downtime and unscheduled repairs. 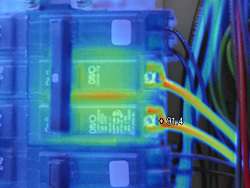 The images shown are actual problem areas discovered with our Fluke Thermal Imager on a recent project. To learn more about our lighting company, thermal testing in Houston, the benefits of commercial LED lighting, and LED lighting rebates, please call Highlights Electrical at 713-266-6464.